Trust Fall (Side A) is a four-track EP by alternative rock band Incubus. It was released in 2015 on Island Records. It was the first release from the band since their 2011 album, If Not Now, When?. The writing and production of the EP began in late 2014 following a Sons of the Seas tour fronted by Brandon Boyd. 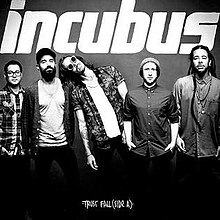 The EP was the first of "at least two" EPs that Incubus planned to release in 2015; they ultimately did not release a second EP that year. Brandon Boyd and Mike Einziger stated in an interview for #Letstalkmusic that the EP format was chosen so they could release some new songs prior to a tour, then finish the rest of the album when they returned. The lead single from the EP, "Absolution Calling", debuted on KROQ. It was followed by a music video. Trust Fall (Side A) was supported by a 2015 Summer tour in the United States, following an earlier tour in 2015 through Australia and Southeast Asia. ^ "Brandon Boyd talks NEW Incubus in 2015 and Sons of the Sea with Oz on 91x". February 23, 2014. ^ "#LETSTALKMUSIC welcomes Brandon Boyd & Mike Einziger (Incubus)". April 24, 2015. ^ "Incubus - Absolution Calling Music Video". March 6, 2015. ^ "Incubus and Deftones announce summer tour". April 16, 2015. Retrieved April 17, 2015.